It could be straight out of a Bond movie. 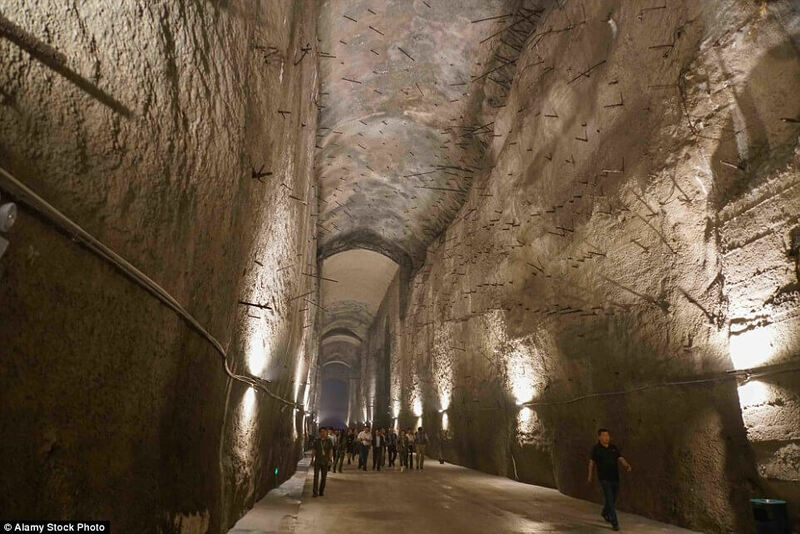 This vast underground cavern, formally a top-secret Chinese nuclear base, has finally opened for tourists to have a poke around. Hailed as the largest man-made cave in the world, the 816 Nuclear Military Plant, located in the mountains of Fuling district in China’s Chongqing municipality, was designed to manufacture plutonium in the 1960s – a 17-year project involving more than 60,000 soldiers. While it was stopped from going into operation in 1984, the base wasn’t declassified until April 2002, and it hasn’t been open to foreign visitors until now. The enormous space spans more than 12 miles, with 18 main caves and more than 130 roads and tunnels, which vehicles are free to pass through. It was designed to tolerate thousands of tons of TNT explosives, and at least 100 workers were reported to have died during construction. These days, it’s been renovated to feature colourful modern lighting, as well as educational displays. And visitors need not fear for their safety.